On 4 January 2016 the Council of the American Astronomical Society voted to make the AAS the institutional home of WorldWide Telescope (WWT), a "Universe Information System" that allows users to retrieve and share data using an interface that resembles either the sky or a 3-D view of our universe. The WWT vote represents a bold step by the AAS, making a commitment to use and adapt new technologies in its stated mission "to enhance and share humanity's scientific understanding of the universe." The AAS leadership role will allow for broad community involvement in further development of WWT. After the vote, AAS Executive Officer Kevin Marvel said, "The AAS is using its mission to guide growth and change in response to community needs. Taking on the WWT effort will be a tremendous plus for the AAS and a tremendous opportunity for the whole community." WWT already connects to a wealth of openly available online data sets, as well as to ADS, SIMBAD, NED, and Wikipedia. WWT is a helpful tool for researchers due to its ability to fluidly connect images to each other and to literature. It's also a rich resource for educators, given the wealth of opportunities it offers for new ways to learn and communicate about the universe. But WWT's full potential is even greater than its current use — and this potential can be realized now that WWT has been made open source and the community can be involved in a new and more expansive way. The accompanying image shows just a small sample of the views WWT offers, including a few where user-added data are visualized as colored points added to imagery or rendered in 3-D coordinates accessible by default from within the program. The 10-minute video "What Can WorldWide Telescope Do for Me?" clearly demonstrates to researchers, educators, and outreach professionals why they might want to use WWT now. The adoption of WWT by the AAS is a great example of a public-private partnership. WWT started as a research project at Microsoft Research (MSR), which distributed the WWT software for free. At MSR, Curtis Wong was the inventor of WWT, and Jonathan Fay was its principal software architect. 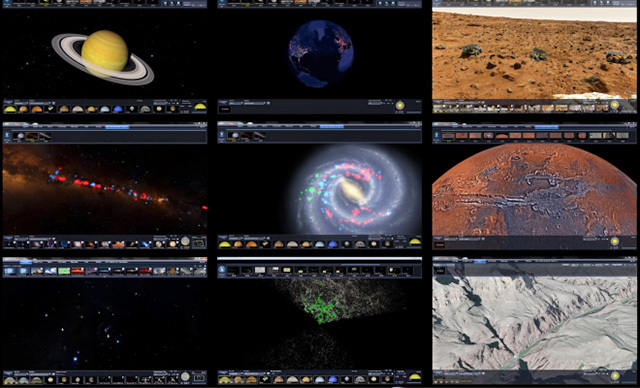 The desktop (Windows) version of WWT is very popular, with millions of users including amateur astronomers, educators, and planetarium presenters. The advent of a fully Web-based version of WWT several years ago allowed the program to start gaining real traction with the professional community. The WWT Web-based tools (API) are highly customizable and have been used to create interfaces that highlight and serve specific survey data, as well as to make viewers that link literature and data, such as the ADS All-Sky Survey, which allows users to learn which parts of the sky have been studied when, and for what reason. Microsoft Research, in cooperation with the .NET Foundation, open-sourced WWT in 2015, so that an even broader community of users could begin to contribute both code and guidance to the project. In parallel, the AAS appointed the WWT Task Force, chaired by AAS Vice-President Jack Burns, in early 2015 to review the possibility of taking on the WWT. The task force sought community input and then put a plan for participation to a Council vote at the 227th AAS meeting in Kissimmee, Florida, on Monday. After debate and discussion, the Council agreed to invest significantly in the effort and to implement the plan developed by the task force. The WWT Consortium is a federation of individuals and organizations who contribute code, data, and services to the larger WWT ecosystem. GitHub is hosting the WWT code at no cost. Microsoft continues to contribute to the WWT effort by hosting data in its Azure cloud. Consortium participants include most major US observatories, and a loose governance and review structure will be established, under AAS guidance, in early 2016. WWT-related projects have recently received more than $6M in federal funding, and $2M from private sources. The largest WWT education-related effort is the "WorldWide Telescope Ambassadors" program, started by Prof. Alyssa Goodman at Harvard, which has been training and deploying volunteer PhD-level scientists to use WWT to teach STEM subjects in classrooms, at public science events, and online through the creation of WWT tours and shared curricula. The Adler Planetarium in Chicago created its very popular "Cosmic Wonder" planetarium show, which highlights modern all-sky multiwavelength imagery, using only WWT and at 1/10th the cost of a typical show. The "Paper of the Future," created in 2014 to demonstrate the new technologies recommended by the AAS Journals Task Force, showcased how WWT can be used to place an image from any online source, including a journal article, on the sky in context of multispectral, all-sky survey imagery with just one click. (Try it here.) And, in a recent paper highlighted by AAS Nova the authors used WWT to look for, and find, very long infrared dark clouds that can define "The Skeleton of the Milky Way." Initial AAS efforts using WWT will focus on integrating one-click image-contextualization into the Society's journals and the AAS's "Astronomy Image Explorer" service, which is already connected to ADS. The AAS will also encourage use of WWT to enhance public-outreach projects via connections to programs like WorldWide Telescope Ambassadors. The open-source nature of the WWT project, and the availability of a well-documented Web-based API, means that organizations can use the technology to build custom services as needed. Developers have created, and will continue to create, services ranging from iOS-based games to sky-survey data servers using WWT. The addition of the AAS imprimatur to the WWT effort will inspire broader participation and support. The Society's mission drives it to find ways to support the community now and explore ways to support it in the future. A wide range of exciting possibilities are enabled by the WWT infrastructure, but the full realization of those possibilities can only be achieved through community input, guidance, coordination and most importantly, effort. This is something central to the Society's mission and role. We do not know entirely what applications our creative community of scientists will develop with WWT, but we do know that the American Astronomical Society can help enable their work by taking on the WWT effort. Exciting times lie ahead!